Thanks to you, last week’s Report on the Collaborative Economy was readily received, and has been viewed over 26,000 times. The media and bloggers alike have picked up on it. As we digest what it means, it’s important to recognize that this is the next phase of the internet and the next phase of social business. An interesting finding is that the second era (social) and the third era (Collaborative Economy) use the same social technologies but, instead of sharing media and ideas, people are sharing goods and services. This is all part of a continuum. We need to understand how our careers will progress as the market moves forward with us. Services needed User Experience, Design, Content Social strategy, community managers, communicators Agencies that help with trust, customer advocates, ? Change in our careers is good. It leads to new opportunities, growth, and even fun. It often requires us to step out of our comfort zones and be prepared to adopt new paradigms. With that said, here are three insights to remember as we enter into this next phase. Prepare for the next phase in your career as we shift eras. The internet continues to evolve and, with, that our careers do as well. The mid 90s saw the blistering heat of the “dot bomb” era. As the internet became a dominant force, it subsided with the global recession and industry implosion until we saw the second phase emerge. We dubbed it “Web 2,” where information creation and consumption was democratized by all. The next phase uses the same principals of sharing and democratization, but involves goods and services. Take what you’ve learned in social business and apply it to the Collaborative Economy. 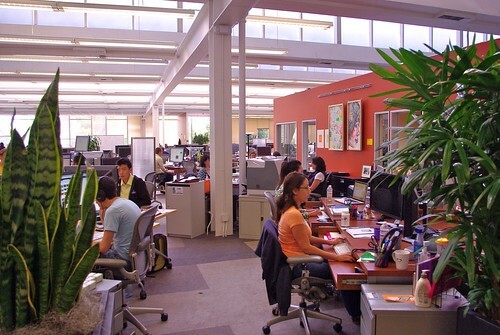 If you’re in social business, you’re in a good spot. The same rules apply about letting go of control, shifting to engage, and connecting with customers. Learning to listen for understanding, engaging with customers, developing programs where customers become your advocates, and applying scalability, all topics I’ve researched deeply, will apply to this next phase. Change is in inevitable. Prepare for this next phase now. The next phase has already begun. 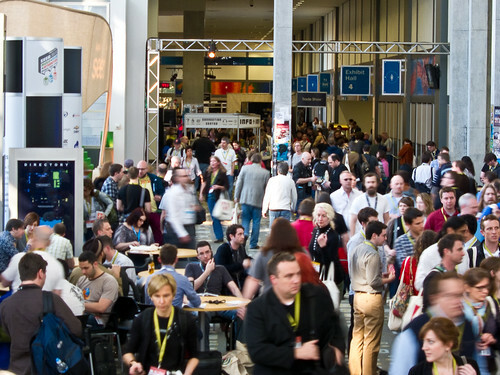 Last week’s LeWeb received international acclaim, and funding to sharing startups is on rise. Even cities like Amsterdam are opening up to the potential of companies like AirBnb. Mainstream media is covering this movement. We must prepare for the next phases of our careers now. We can and will do this together. I hope this graphic and matrix help to clearly articulate our next phase. Save it, share it and activate on it now. If you’d like to join me on a webinar to learn more and ask questions, you can register on this page. Remember, those who adapt, win. 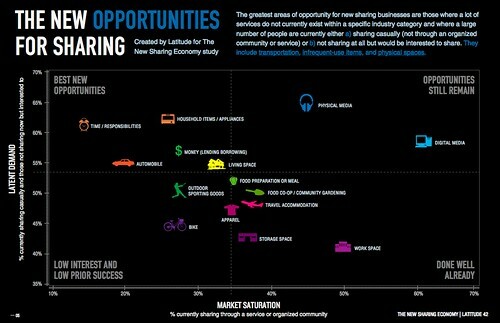 Above Image: Market Opportunities for the Collaborative Economy by Vertical, from Sharable Magazine follow them on Twitter.What’s the next phase of Social Business? That’s the question I’m frequently asked. Without a doubt, the next phase is the Collaborative Economy. 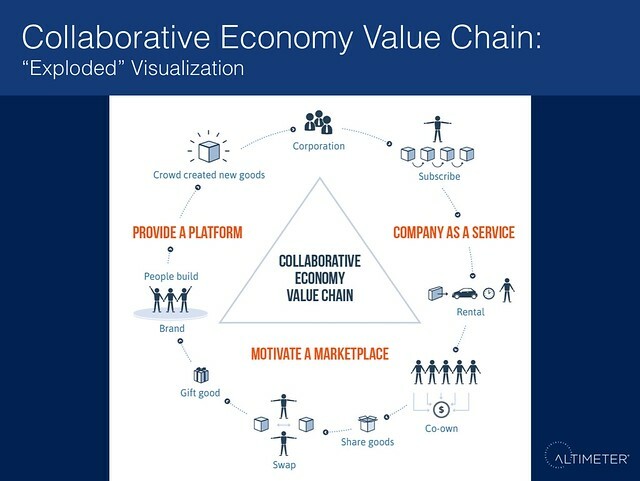 What’s that the Collaborative Economy? It’s where brands will rent, lend, offer subscriptions to products and services to customers or, even further, allow their customers to lend, trade, or gift branded products or services to each other. This unstoppable trend is fueled by the social web. 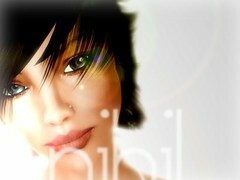 Its specific features include relationships, online profiles, reputations, expressed needs and offerings, and ecommerce. Brand customers are already starting to conduct these behaviors among themselves using TaskRabbit, AirBnb, Lyft, and many others tools. Some of these are disruptions for brands. Others are opportunities. While this movement will have broader global and economic impacts, at Altimeter we’re focused on disruptions to corporations. We’re knee deep in interviews for our next report on the Collaborative Economy. We have interviewed startups, venture capitalists, brands, social business software vendors, authors, and thought leaders. We are dissecting data of 200 sharing startups for a broad overview of what it means to business. Caveat: There are many broader impacts inside of a company that also impact HR, recruiting, supply chain, IT and other departments. Those cited above are just a sample of the most often publicized impacts. What are some examples of companies that are already taking advantage of this new social business trend ? Here are a few from the Master List of Brands Participating in the Collaborative Economy: Toyota, OnStar and BMW are allowing cars to be rented so that they can stay current with car sharing or lending services like Lyft, RelayRide, Zipcar and Uber. Barclays Card sponsors and supports bicycle sharing in the city of London, associating their brand with the movement. Retail giant, Wal-Mart, is considering competing with TaskRabbit and Amazon by allowing customers to deliver goods to each other. What are the immediate business opportunities? There’s a long list, and the report will probe them in detail, but it will include sponsorships, partnerships, investments in startups, building branded communities that enable renting and gifting, customer advocacy programs, and more. I’m seeking a “Software as a Service” (SaaS) startup that would enable this for brands and dedicate an entire post outlining the market opportunities. For example, on just the retail vertical, yesterday I met with Neal of Sharable Magazine, and he shared many opportunities for retailers. So there you have it, the next phase of Social Business goes beyond marketing and customer support. It changes the fundamental business models and relationships that we have with our customers. The big change that brands will have to face is that they will have to care about the relationship between customers as they trade and rent your products between themselves. How they think: Brands are in charge. Deal with it. Brands are in charge. Deal with it. Customers are in charge. We are listening, and we will engage. We care about your current experience with our goods. We must now care about extended life of good after we sell it, and the relationship between customers. 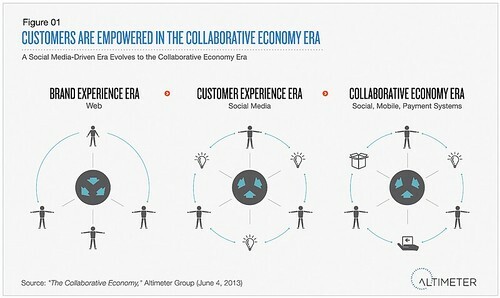 Stay tuned for Altimeter’s report on the Collaborative Economy in just a few weeks. I’ll be presenting the findings at LeWeb, which is themed on the Sharing Economy. Thank you, Vivian Wang and Neal Gorenflo for the inspiring interviews these past few days. Imagine your great-grandchildren interacting with your likeness on a daily basis, all derived from your Facebook media, Vine videos and your personality from your Tweets. Humans, both poor and rich have continued to seek out the greatest quest since the dawn of mankind; how do we stay alive in this world? Fortunately, (or not fortunately) new technologies are emerging both now, including some fascinating developments by leading think tanks, including Stanford. Whether you find it creepy, narcissistic, or a thoughtful way to connect with future-generations, this is a choice we’ll all be forced to reckon with. Should we shutter accounts? Allow them to be memorials, with or without comments? Allow data to be used to digitally reanimate us? There’s even impacts to corporations, as employees who are public in social channels who will eventually leave this plane, and a communications plan will need to be erected to deal with both the grief at a human way, but also how their personal, or hybrid (work/personal), or corporate social media accounts will be used. Family of deceased mandates content to be removed IP created at work is owned by company, yet employee may have used personal social accounts IP created at work is often owned by company but now as people use personal social accounts, who owns? Deceased employee has content set to publish on timer Deceased employee has content on timer, set to publish in coming weeks, potentially conflicting with announcement strategy, messaging and general confusion. Does company have ability or right to alter settings or access login credentials? Family has access to corporate social media accounts Using Lifelocker, the deceased has turned over access to social accounts that deceased employee used during work. Ownership is not clear, as the account spans personal and professional usage. Research: There’s been some expert research conducted by Jed Brubaker on this topic, including publishing of papers and speeches. Mashable: What happens to your social media account after you die. Some interesting examples of wills, legal matters, social network terms of service. Officials debate who can interact with a deceased social networking account after death. In one sad case, bullies continue to harass a deceased on social networking account but policies and settings aren’t clear how to stop it. First hand account from Robert Fransgaard, who shares the steps he went through managing a deceased loved one. Please read a 5 practical steps in handling the social media presence of a deceased. Social Media Wills: There are strong arguments that individuals need to draft a will on how your social accounts will be used post-life, so family members aren’t left guessing, nor bicker over your wishes. Here’s the elements to have in your social media will. Corporate Social Media Policies Post-Life: While I don’t see much online, companies must also develop social media policies on how hybrid accounts (personal accounts that are branded with company, like (LionelAtDell) will be used, or not used. Could public social media content created at work be used by third parties including the family, or future digital reanimation companies? Most employment contracts indicate that all content created at the company (on company networks, or software) is owned by the company. What right does a company have to use that public facing social media content, after an employee passes on? Social Networking Deceased Operations: A number of social networks have forms to allow family to manage, shutter, or archive the deceased social networking accounts, see Google requires you to snail mail a letter, Twitter asks you to also mail physical documentation, apparently Facebook provides a “memorial state” feature than enables a user to be remembered. Future: I visited the Stanford Virtual Reality lab last month, and was able to hear from the Professors who have a simulated lab that they’re already starting to experiment with aggregating Facebook photos to recreate faces. They could easily do this for the deceased. Legacy Locker: Allows for the loved ones of a deceased to manage the social media accounts, ecommerce accounts, banking accounts, and more, through a one-stop management tool. _LivesOn: Slated to launch soon, this tool would provide Tweets post-life for deceased to communicate with those around them based on analysis of your existing twitter content and behaviors. LifeNaut.com was created to help people build a rich profile of information that preserves their essential, unique qualities for future generations and family members. Expect a new industry to emerge that offers the following services: Estate planners factor in social media accounts, and blogs and websites, as part of the estate. New software emerges to allow people to opt-in to have themselves digitally communicating with their future kin for generations. In a few short years, expect new virtual reality and simulation software to aggregate and analyze a deceased photos/videos from social networks, and replicate their face, mannerisms, in a way we are most familiar with. In the not-so-radical future, expect that future generations will be able to have the capability to replicate you in a virtual manner, based on the digital trails we’re leaving behind by the gigabyte. Assume technology will advance to digitally reanimate us, individuals, families, officials, employers must plan for this inevitable future now.